Read below how we helped Mike with the introduction of BluOS into his home. My name is Mike and I run a Graphic Design company in Hampshire. Last year we renovated the family home and one of the intentions was to set the Hi-Fi back up and get listening to our record collection again. My journey into a new system started when my wife commented that listening to records sounded much better than when we used our streamer. I looked into this and changed our streaming service to Tidal which offered better quality which was great, but I wondered if there was more that I could do to improve things. 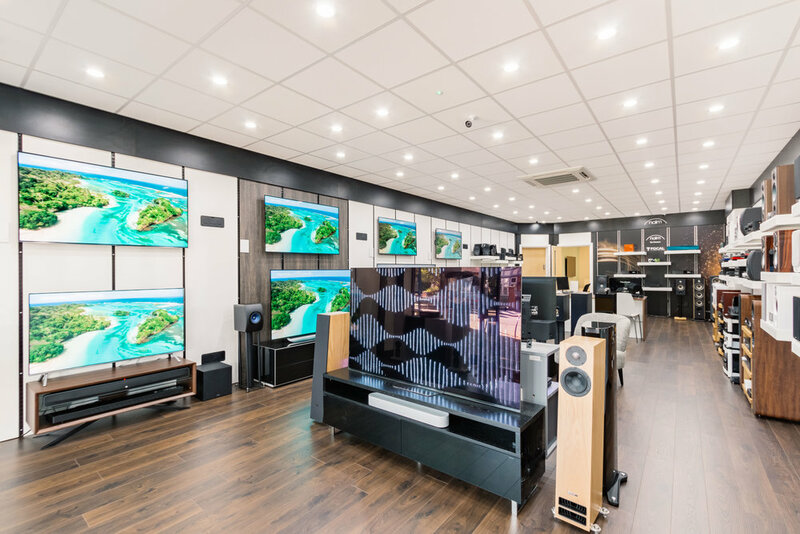 I spoke to my local Sevenoaks store and was given some great advice as to how I could further improve my main Hi-Fi system using a NAD hi fi with their BluOS streaming built in. This would let me listen to Tidal as I had been as well as adding MQA which is like listening to the master tape – the difference was a big step up from my old system and I was really impressed. These are such a huge upgrade to my old active monitors. I use these in my home office and the sound has just blown me away, the powernode easily drives the KEFs and gives a huge stereo image. I’ve had a few monitors in my time but these are something else. Even at low listening volumes, the detail and soundstage are incredible. I’ve thrown everything from Electric Messiah by High On Fire to Solaris by D Bjarnason & Ben Frost and the units have handled it all without breaking a sweat. Seriously impressed. And (we all know it’s important) both the KEFs and the Powernode look understated, ooze class and are extremely solid. I feel really spoilt with these in my workspace, the perfect pairing. Both the streamer and the power amp replaced a very good system that I had no issues with but managed to seriously up what I thought was possible from my Monitor Audio and REL speakers. I was initially a bit nervous about a new system with BluOS, but everything was extremely straight forward, and I was up and running in no time. TIDAL sounds incredible and my vinyl has never sounded so good. The sound is very forward but not brash or harsh in any way. Again, I love how these things look. Hi-fi can look pretty bad but NAD have always been a favourite. My first ever amp at 16 was a NAD and I’ve loved the looks ever since. The Bluesound Pulse Flex has become a favourite of mine. This unit goes all over the house. Because it’s chargeable and therefore cable free it goes to the shed, garage and even in the garden. I mainly us it to listen to Radio 4, Audible or podcasts but I’ve also grouped it (super easy) with the rest of the lounge system and it hasn’t sounded out of place at all. A very capable little unit. Again like the whole Blusound system it was extremely easy to set up and looks great. View the full range of Bluesound products here, and the full range of NAD products here. Get in touch with us today to discuss how BluOS can integrate into your home and lifestyle. We are also running a series of events, "The Future Of Sound", starting 16th March 2019 so you can experience the incredible BluOS System first-had. Click here for event dates.